1. Make another array for prefixes. Store first characters of original strings in this array. 2. For all the prefixes to the left of it (in the prefix array), check whether this prefix has been used somewhere. 3. If it has been used, check whether you can add on character to the previous duplicate prefix, if not, add one character to the one that is being checked for duplicates. This tester program tests the important methods of this class. boolean contains(Key key) is there a value paired with key? boolean isEmpty() is the table empty? This program divides two numbers without using the division operator (/). 1. If the number of elements is less than 10, use insertion sort. 2. If the number of elements is more, swap the first element with mid element. 3. If the number of elements is even more, swap the first element of the subarray with the median of the three elements (lo, mid, hi). 4. If the number of elements is even more, swap the first element with (Tukey's Ninther). 1. Setting the element with index hi (the pivot element) equal to the median of the three elements lo, hi and (lo+hi) / 2 so that the probability that it lies in between the values is more. 2. Using the faster Insertion sort if the number of elements in the sub array is less than some predefined value (the value 5 is used here). 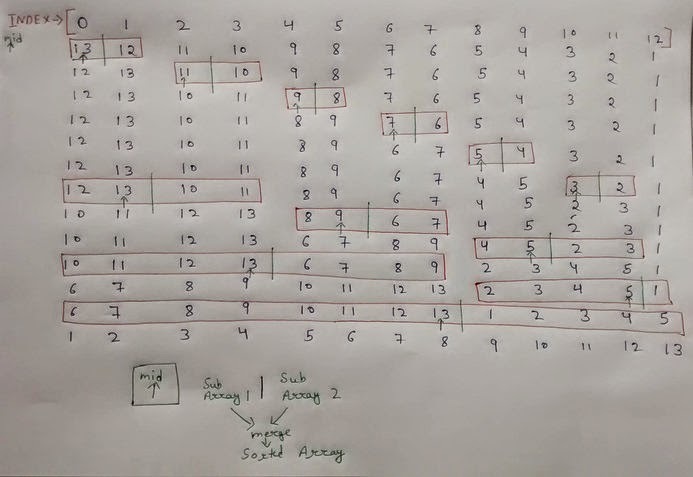 Bottom up merge sort sorts the array without using recursion. It is 10% slower than the top down (recursive) mergesort. The idea is to start sorting the array elements from the start in groups of 2, 4, 8, 16, and so on (powers of two). So that the effect is the same as the recursive algorithm. takes care to see that the mid value falls before end. Math.min() takes care to see that end does not extend beyond the last index.